A population-based case-control study was conducted in several provinces of Iran on 2463 mothers referred to health care centers. Appropriate descriptive and analytical statistical methods were used to evaluate the association between maternal risk factors and the risk of preterm birth. All tests were two-sided, and P values < 0.05 were considered to be statistically significant. The mean gestational age was 31.5 ± 4.03 vs. 38.8 ± 1.06 weeks in the case and control groups, respectively. Multivariate regression analysis showed a statistically significant association between preterm birth and mother’s age and ethnicity. Women of Balooch ethnicity and age ≥ 35 years were significantly more likely to develop preterm birth (OR: 1.64; 95% CI: 1.01–-2.44 and OR: 9.72; 95% CI: 3.07–30.78, respectively). However, no statistically significant association was observed between preterm birth and mother’s place of residence, level of education, past history of cesarean section, and BMI. Despite technological advances in the health care system, preterm birth still remains a major concern for health officials. Providing appropriate perinatal health care services as well as raising the awareness of pregnant women, especially for high-risk groups, can reduce the proportion of preventable preterm births. Preterm birth is defined as delivery before the gestational week 37 or day 259 [1–3]. It has been the most concerning complication among pregnant women and affects 10% of all pregnancies. Annually, 1 million neonatal deaths occur due to preterm birth . It constitutes a large proportion of medical expenses and impose enormous economic burden on health care systems, families, and children . Preterm birth is still a prevalent public health issue responsible for high perinatal mortality and long-term morbidity worldwide Despite improved perinatal care programs, it still remains a major leading cause of perinatal mortality, particularly in developing regions [5, 6]. Preterm birth is a multifactorial phenomenon, partially in association with immunologic, genetic, and environmental factors; however, its attributing factors have not yet been well studied [7, 8]. Previous studies concerned with preterm birth indicated that 45–50% of causes are unknown, 30% can be attributed to premature rupture of the membrane, and 15–20% are medical indications such as elective labor [8–10]. Recent studies have suggested that preterm birth is an independent risk factor for future cardiovascular diseases, cardiac ischemic diseases, and stroke [11, 12]. Due to the enormous economic and emotional burden of preterm birth and its associated complications, this study was conducted to examine the association between prenatal risk factors and preterm birth. This population-based case-control study was conducted on 2463 mothers, including 668 cases and 1795 controls, referred to a health care center in several provinces of Iran, namely, Fars, Hormozgan, Kermanshah, Hamadan, Kohgiloyeh, and Boyerahmad, Yazd, Southern Khorasan, Golestan, and city of Mashhad (Fig. 1). A rural health care center is a health facility in a village that provides health care for approximately 9000 people of that village and several neighboring villages. Health care providers at a rural health care center include a general physician and public health and midwifery experts. The rural health care center supervises and supports health care facilities in villages and is linked to its superior urban health care center. An urban health care center is a health facility in cities providing care to approximately 12,500 people. Health care providers, including a general physician and public health and midwifery experts, provide laboratory, pharmaceutical, radiological, and medical care in the urban health care centers. Experts at rural and urban health care centers register the provided health care to every family in their health records, such as health care for pregnant women. However, the registered information in the family’s health records were insufficient, and hence we collected additional data through interviews with the study participants. The case group was defined as women who had preterm birth in a recent pregnancy, and the control group was defined as women who had full-term birth in a recent pregnancy [13–15]. The sample size ratio in the control and case groups was 3:1. Data were collected through interviews according to a check list containing demographic information (mother’s age, ethnicity, occupation and level of education, place of residence, and consanguineous marriage) and information on the previous pregnancies (the outcome of previous pregnancy, mode of delivery, and interpregnancy interval). Study subjects were recruited through a multistage cluster sampling method. 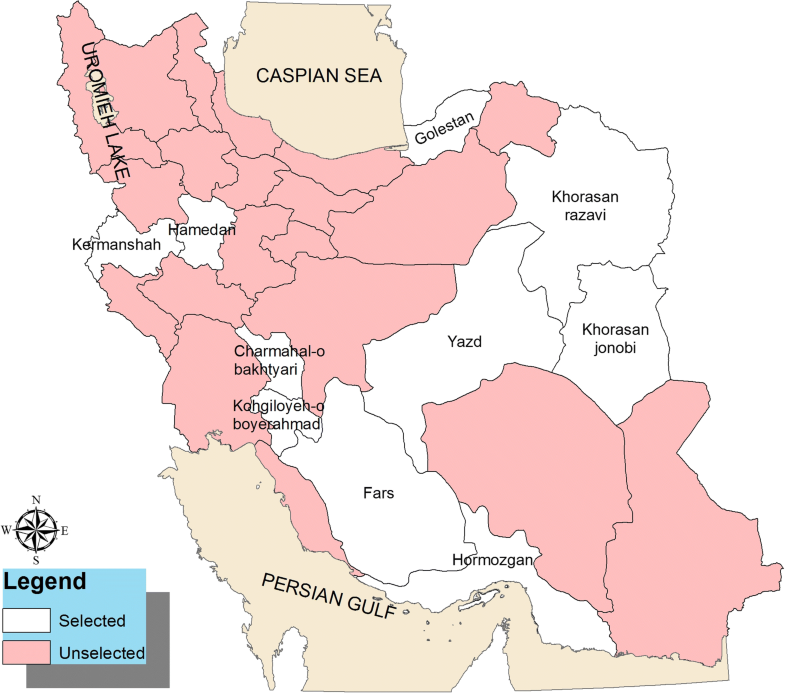 In the first stage regarding geographical divisions of Iran, nine clusters (provinces) were randomly selected. In the second stage, in each of the nine clusters (provinces), four clusters (cities) were randomly selected from the north, south, east, west, and central areas. In each city, two health care centers (one urban and one rural health care center) were randomly selected. In each health care center, 10 check lists were filled in by well-trained interviewers according to a protocol. In each center, data collection process was conducted simultaneously on the same day for cases and controls. Data of the control group were collected from a random sample of mothers referring to the health care center. If < 10 cases were available in each health care center, the remaining check lists were filled in the nearest center, and if there were > 10 cases, the check lists were filled in for a random sample of mothers. We tried to maintain the same size for the case and control groups. According to literature review, considering mother’s age > 35 years as a risk factor (p0 = 0.3, p1 = 0.44, z0.95 = 2, z(1-β) = 0.8, design effect = 2)  and using the proportion determination formula, the sample size was estimated as 370 for each study group. In this study, the association between preterm birth and 14 independent variables was evaluated. Therefore, taking into account an additional 20 samples for each independent variable, the total sample was calculated as 650 for each study group. The sample size was sufficient considering > 80% power of study. Sociodemographic information included mother’s age (age < 35 or ≥ 35 years), place of residence (urban vs. rural area), occupation (housewife/employee/cowhand/farmer/carpet weaver), level of education (illiterate/primary school/intermediate school/high school/academic gradation), ethnicity (Turk/Lor/Arab/Balooch/Torkaman/Fars/Kurd or others), and marriage (consanguineous vs. nonconsanguineous). This included history of abortion, stillbirth or cesarean section (yes/no), interpregnancy interval (the first pregnancy/< 1 year/1–3 years/> 3 years), BMI (normal/low weight/overweight/obese: grade 1, grade 2, and higher), and cycles of menstruation period (regular/irregular). Preterm birth was the outcome variable, which was ascertained through questioning the exact gestational age at the time of birth. Descriptive statistical tests were performed for socio-demographic and pregnancy-related variables. Bivariate analysis was performed to identify the association of dependent and independent variables. Odds ratio was computed to see the strength of association between preterm birth and each of categorical variables. Adjusted odds ratio and their 95% confident interval were calculated by including all exposures with p value < 0.3 in the multivariate model to control for confounding effects . Data were analyzed using SPSS version 19, with two-tailed tests at p ≤ 0.05 level of significance. This study was conducted on 2463 mothers referred to health care centers (668 cases with a history of preterm birth and 1795 controls without a history of preterm birth). The mean gestational age at the time of birth was 31.5.” 4.03 vs. 38.8 ± 1.06 weeks for the case and control groups, respectively. Our analysis revealed that 88.8% of cases and 94.0% of controls were 35 years of age. Regarding the ethnicity, 76.8% of cases and 64.1% of controls were Fars. Village dwellers comprised 51.9% of cases and 60.3% of controls. Regarding previous pregnancies, 5.8% of controls reported a history of stillbirth, 12.9% of cases and 11.4% of controls reported a history of cesarean section, and 15.3% of cases and 8.6% of controls had a history of abortion. Birth interval was longer than 3 years in 28.9% of cases and 30.4% of controls (Table 1). Mothers with a consanguineous marriage were 1.32 times more likely to develop preterm birth (OR: 1.32; 95% CI: 1.04–1.67), those with a history of abortion were 1.57 times more likely to develop preterm birth (OR: 1.57; 95% CI: 1.08–2.27), and those with a history of stillbirth were approximately 4 times more likely to develop preterm birth (OR: 3.92; 95% CI: 2.76–5.57) (Table 2). Mothers aged 35 years or more compared to those younger than 35 years were 1.64 times more likely to develop preterm birth (OR: 1.64; 95% CI: 1.01–2.44). Regarding ethnicity, Balooch mothers compared to Turkish mothers were 9.27 times more likely to develop preterm birth (OR: 9.72; 95% CI: 3.07–30.78). Mothers with irregular cycles of menstruation period compared to those with regular cycles were 1.77 times more likely to develop preterm birth (OR: 1.77; 95% CI: 1.14–3.01). Regarding the interpregnancy interval, mothers with < 1-year interpregnancy interval compared to those with > 3 years were 1.85 times more liable to develop preterm birth (OR: 1.85; 95% CI: 1.14–3.01). However, no statistically significant association was observed regarding mother’s place of residence, level of education, supplement consumption, history of cesarean section, and BMI (Table 3). The etiology of preterm birth has been a major concern in obstetrics worldwide. The cause of 50% of preterm births is unknown . However, this study revealed a strong association between preterm birth and a history of abortion and stillbirth, ethnicity, interpregnancy interval, cycles of menstruation period, and consanguineous marriage. Consistent with other studies in this area, our study suggests an increased risk of preterm birth for mothers older than 35 years [18–22]. Martin et al. found an increased risk of preterm birth associated with older ages in women of high economic status . The majority of studies indicated that the increased risk of preterm birth associated with increasing mother’s age may be confounded by socioeconomic factors or health complications associated with older ages, namely, hypertension, and renal diseases. Preventive strategies for older age mothers include providing appropriate health education and consultation, regular perinatal care during pregnancy, and encouraging mothers toward seeking effective family health [11, 22, 24]. Along with other studies, our study results suggest an association between preterm birth and ethnicity [4, 13, 15, 25]. Among all the studied ethnic groups, Balooch ethnicity was associated with an increased risk of preterm birth. This increased risk can be attributed to low socioeconomic status, high reproductive rates, low reproductive health status, insufficient reproductive knowledge, and poor nutrition. Preterm birth is affected by differences in ethnic groups regarding parents’ level of education, tobacco use, distress, and unfavorable experiences in life [13, 14, 26]. We observed an increased risk of preterm birth associated with consanguineous marriage, which was consistent with the results of other studies examining the genetic risk factors . In addition, it should be considered that preterm birth can be affected by different environmental factors as well. Several studies suggested that even in the absence of genetic factors, preterm birth is associated with environmental factors such as socioeconomic status and tobacco use [27, 28]. Moreover, a number of studies suggested an interaction between preterm birth and parental genes or inheritance of human leukocyte antigen [29, 30]. Consistent with other studies, the present study demonstrated that a history of abortion and stillbirth is associated with an increased risk of preterm birth. Recent studies suggested an association between history of abortion and increased risk of preterm birth in subsequent pregnancies [11, 18, 31]. In addition, three large, population-based historical cohort studies and two large, case-control studies suggested that a history of abortion is a risk factor for preterm birth [31–33]. Several studies found an increased risk of preterm birth in association with more abortions and also indicated that various genetic and environmental factors can lead to repeated abortions [34–36]. It was also observed that abortion as the result of the last pregnancy is associated with an increased risk of preterm birth in gestational weeks < 32. The strength of this association decreases with increasing gestational weeks . Although we observed an association between preterm birth and history of abortion, a population-based study in Pakistan reported conflicting results. Such inconsistent results can be attributed to the differences in the methods or limitations such as using data extracted from registry systems, lack of a control group, different definitions of gestational weeks for abortion, lack of control on potential biases, and confounding effects [31, 37]. We found that mothers with irregular cycles of menstruation period compared to those with regular cycles were more likely to develop preterm birth. Bonessen et al. also showed that regular cycles of menstruation period are associated with lower risk of prolonged pregnancy. In women with regular cycles of menstruation, the exact gestational age is clear and health care providers are not concerned with induction of pain . Consistent with the results of other studies, our study results suggest an increased risk of preterm birth in mothers with < 1-year interpregnancy interval [39, 40]. Adams et al. suggested an increased risk of preterm birth associated with a 6- to 11-month interpregnancy interval. This risk decreased for interpregnancy intervals of > 47 months . Krymko et al. suggested that this association can be attributed to the presence of intrauterine infections before pregnancy or acute infections during pregnancy, mother’s physical weakness, emotional status, hormone secretion due to distress, or uterus contractions. Preterm birth is a multifactorial issue in obstetrics. Despite technological improvements in the health care system, it still remains a major concern for health officials. In the present study, ethnicity, history of abortion and stillbirth, irregular cycles of menstruation period, consanguineous marriage, and narrow interpregnancy intervals were found to be risk factors for preterm birth. Regarding preventive strategies, it is recommended that mothers be provided with reproductive health care before and during pregnancy, particularly in the high-risk groups, to reduce the proportion of preventable cases of preterm birth. The large sample size of the present study selected from several provinces includes different ethnic groups and socioeconomic status and increases the generalizability of results to the general population. In addition, data were collected by well-trained interviewers according to a predetermined protocol. However, the results of the present study should be interpreted with caution due to potentially uncontrolled confounding effects, recall bias related to history of abortion, and reporting bias due to self-report nature of data collection method. In addition, the time interval between the last abortion and current pregnancy was not recorded in the mother’s profile. The authors would like to thank the Research Center for Health Sciences of Shiraz and Hormozgan Universities of Medical Sciences, research affairs, and other renowned Universities that participated in this project and provided their services with dedication. The project was approved and financially supported by the Vice Chancellor of Research in Shiraz and Hormozgan Universities of Medical Sciences with registration numbers (No. 93–01-42-8964) and (No. 94112), respectively. MS and TV (data acquisition, drafting the manuscripts in Persian and revising the manuscripts in English), HRT (Designing project and supervision), ShS (data acquisition, quality control of data in Khorasan Razavi province), ME (data acquisition and revising the manuscripts in English), HY (data acquisition, quality control of data in Hormozgan province), EM (data acquisition, focal point of data gathering in Hamadan province), AR(designing project in statistical analysis section, data analysis and prepare of results), AGh (data acquisition, focal point of data gathering in southern Khorasan province), NK (data acquisition, focal point of data gathering in Yazd province), ME (data acquisition, data entry and quality control), AN (data acquisition, focal point of data gathering in Golestan province), SAH (data acquisition, focal point of data gathering in Fars province), FZ(data acquisition, focal point of data gathering in Hormozgan province), SM(data acquisition, quality control of data in Yazd province), KE(Designing project and supervision), AT(Designing project and provided financial support to generate copies of questionnaires, interviewing costs, and transportation costs for interviewer’s team during the data collection procedure), CS(data acquisition, checking quality of final data), MH (data analysis, prepare of tables). All authors read and approved the final manuscript. Ethical approval was granted by Shiraz university of Medical Sciences Research Ethics Committee (Ir.sums.rec.1394.f330). All participants provided written informed consent prior to interview; this included permission to use anonymised quotations in publications.